As children, most of us have been taught the phenomenal event that occurred over 2,300 years ago when the son of the Maurya Emperor Asoka of India brought to this land a doctrine that altered the path of its destiny. Missaka Pawwa or Mihintale, as it was later identified, was the place where this most magnanimous of all gifts received in Sri Lankan history was accepted by the ruler of this land. 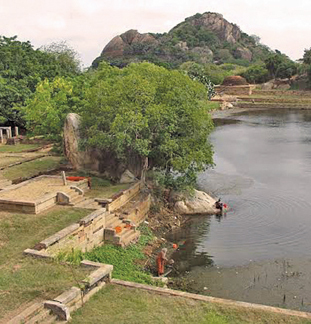 Arahat Mahinda along with six other disciples appeared before King Devanampiya Tissa near the now famous Mihintale. Chethiya Pabbatha is another name coined for this historic mountain range. The origins of name are debated. 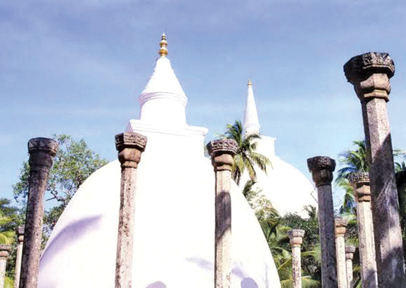 Some say it was so named by King Tissa who later took up the prefix Devanampiya in honour of Arahat Mahinda. Scholars say that Arahat Mahinda was born at a place called Chethiyagiri in North India. The more accepted belief, however, is that the mountain range was named Chethiya Pabbatha due to the hundreds of Stupas that were built on the hills throughout the ages. The foundations of Buddhist civilization that flourished for centuries were laid at the very place where the doctrine was received. In a matter of years, the hunting ground of the Sri Lankan kings was converted into a massive monastic complex that housed thousands of meditating monks. With the introduction of Buddhism to Sri Lanka, art, architecture, sculpture and paintings flourished with inspiration from the teachings of the Buddha. The people and the rulers of the land who had by now enthusiastically embraced the new religion were the sponsors of the sea of sagas. 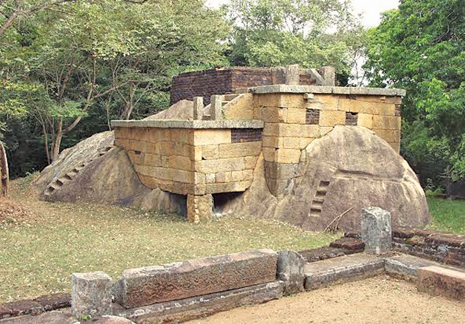 The caves that were prepared and donated to the Sanga bear inscriptions that are the oldest forms of writing in Sri Lanka. 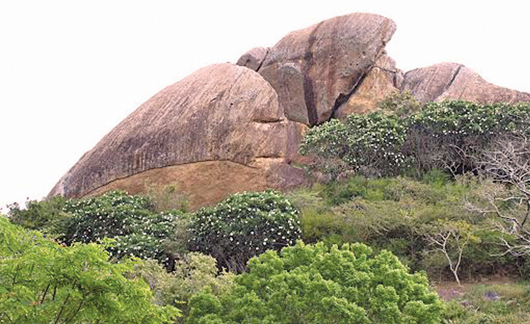 The many rock boulders that adorn the Mihintale range were carved into dwelling for the monks. Among the rock boulders on the summit of the sacred Mihintale are found some interesting caves. Said to have been occupied from time to time by monastic monks, the bricks and clay walls forming with the overhanging rock roof, is testimony to the snug and fairly roomy shelters. These caves no doubt represent the first dwellings of the Buddhist monks of the earliest period of Sri Lanka's history of Buddhism. I visited the Rajagirilena hill and Kaludiya Pokuna at Mihintale, two magnificent sites usually missed by the thousands of visitors who throng to Mihintale during the Poson season. Numerous are the ruins scattered around the Kaludiya Pokuna. The Rajagirilena hill is a lower hill of the Mihintale range. Here, the magnificent rock boulder, which have been converted into caves, form the vast complex that would have sheltered hundreds of monastic monks. The remains of monastic complexes indicate them to be the residential area for monks headed by Arahat Mahinda. These are natural caves covered in greenery, and entering them, one gets the feeling of calm and tranquility, savoured by the monks who lead an ascetic life. A pathway with Araliya trees on either side leads to Rajagirilena at the summit of the hill. This cave, according to archeologists, was the shrine room of the ancient monastic complex. The monks meditating in the caves in the area, probably performed many rituals at this picturesque cave shrine. A huge and long Katarama or drip-ledge has been cut into the rock surface at Rajagirilena to prevent rain-water flowing inside. 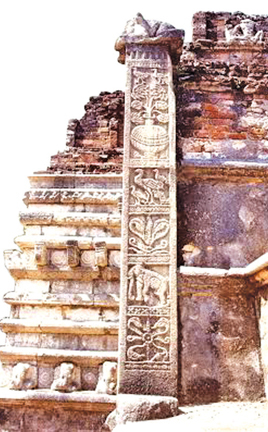 Even today, some remains of the shrine room at Rajagirilena are still visible, despite the centuries of neglect that have taken its toll on the ruins. Inside the cave there are two fragmented statues of the Buddha, with the torso intact but the head missing. These, of course, are the results of vandalism and treasure hunting rather than natural decay. The walls of the shrine room are also in a dilapidated conditon, with some already collapsing. The drip-ledged of the cave had been meticulously carved to prevent rain water from seeping through, while a small tank at the entrance of the cave collected the water. On the opposite side of the Rajagirilena hill lay the magnificent Kaludiya Pokuna, shaded by humongous trees and surrounded by many ruins. A meandering flight of steps between two huge rock boulders and trees from Rajagirilena hill took me to this enchanting pond, which is the largest such water body in the complex. The massive pond, situated on the western slopes of the Mihintale range, is said to have derived its name from the fact that the water in the pond appears to be black in colour. Although it appears open today, Kaludiya Pokuna was completely shut off from the outside world with walls in the past. It was accessible only through two doorways, which is believed to be a private bathing place of the meditating monks of the Mihintale. Today, the pond facilities water requirements of the monks and the villagers who live in the vicinity of the pond. The number of the ruins scattered around the pond had been intricately conserved by the Department of Archeology. After visiting these sites, I headed to Ambastala Dagaba and Kantaka Cheitya of Mihintale, which lies through the Araliya pathway, where the pilgrims take the first steps to reach the higher levels of the monastic complex. Here the rock carved stairway leads to a plateau where the ruins of an ancient refectory lie. The well-engineered system to bring water to this place is still intact. Massive Bath Oru or rice vessels are also seen here. On the either side of the entrance to the building are two inscriptions engraved on large slabs of granite known as the Mihintale stone inscriptions. At the end of the next flight of steps, the Ambastala Dagaba could be seen. It is said to mark the spot where the King Devanampiya Tissa received Arahat Mahinda while the monk stood on the Aradhanagala. The Ambastala Dagaba was built according to the Vatadage tradition and the stone pillars that held the roof over the Dagaba are still visible. From the area of the Ambastala Dagaba, one can proceed to the Aradhanagala. Kantaka Cheitya is another fascinating ruined stupa located on the peak of the range. Some of the oldest traits of Sri Lankan architecture can be seen here. 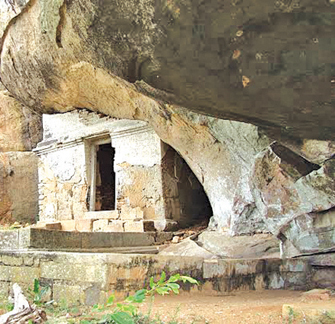 The cave in which Arahat Mahinda meditated, called Mihidu Guhawa, and numerous other significant sites are spread throughout the mountain range. So when you visit Mihintale to commemorate the birth of Buddhism this week, make sure you leave a few hours free to explore this vast complex. The discoveries one can make are both fascinating and rewarding. This cradle of Sri Lankan civilization still offers the people of our country a glorious window into the past.